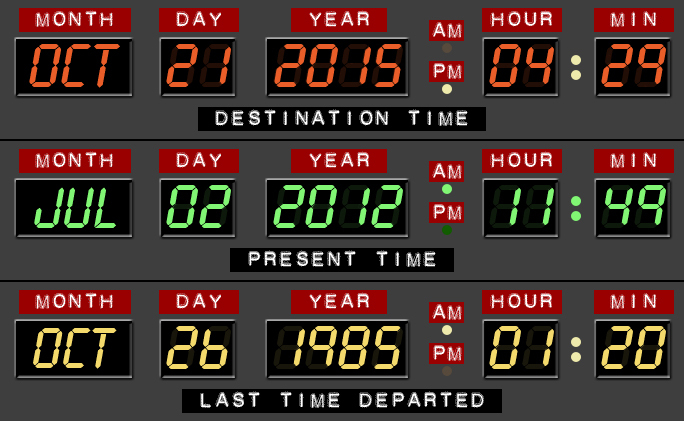 Roboseyo: Happy Back to the Future Day! Yes, it's already October 21 in Korea. 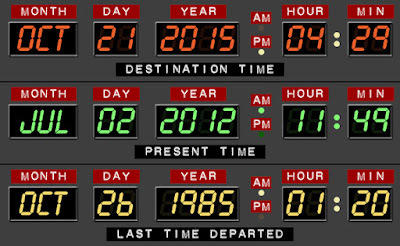 Anyway, today is the day Marty McFly was supposed to arrive in 2015. We don't have mass market hoverboards. Only fancy rich-people ones. Though the ones we DO have can go on water. We don't have self-lacing shoes, or self-fitting or self-drying jackets. We are still using our hands to play video games. We can't hydrate a pizza in five seconds. And I can't banter with Max Headroom in an 80s cafe. We DO have huge wall-sized TVs. We DO have drone cameras that can record news events. We DO have shops and cafes where you can order stuff without talking to a human. Meanwhile, the Back To The Future team didn't imagine terrorism, smartphones, selfie sticks, or social media, beards or skinny jeans. So... I'm going to go legally obtain a digital copy of Back To The Future 2 sometime today, and go get nostalgic. Happy back to the future day, folks.